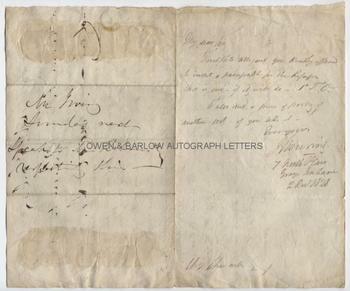 SIR JOHN BOWRING autograph letter Signed with MS article. British (English) political economist, polyglot, writer and colonial administrator. 4th Governor of Hong Kong. ALS. 2pp. 7 North Place, Gray's Inn Lane, 2nd December 1828. To Henry Thwaites. "Freshfield tells me you kindly offered to insert a paragraph for the Refugees. Here is one if it will do - P.T.O. I also send a [. . .?] of [poetry?] of another sort - if you like it." 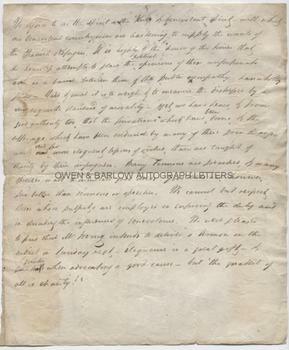 On the verso is a long MS in the hand of Sir John Bowring: "We rejoice to see the spirit - the kind and benevolent spirit - with which our benevolent countrymen are hastening to supply the wants of the Spanish Refugees. It is highly to the honour of the times that the heartless attempts to place the political opinions of these unfortunate men as a barrier between them and the public sympathy has wholly failed. Hard and cruel it is to weigh and to measure the distress by a very exquisite standard of morality- yet we have heard, and from good authority too, that the privations which have been borne and the sufferings which have been endured by many of these poor strangers would read far more eloquent lessons of virtue than are taught [. .?] charity by their impugners. Many sermons are preached and many speeches made to inculcate good deeds. Good deeds are however far better than sermons or speeches. We cannot but respect those whose pulpits are employed in enforcing the duty and in spreading the influence of benevolence. We were pleased to find that Mr Irving intends to deliver a sermon on the subject on Sunday next. Eloquence is a great gift - and greater when advocating a good cause- but the greatest of all is charity!" Endorsed with a note in another hand (presumably by Mr Thwaites) "Mr Irving, Sunday next. Speak to Mr [R. . .?] respecting this". 4to. Approx 9.75 x 8 inches. Old creases. Somewhat age toned. Mounting traces and slight mounting damage. Very good. John Bowring had been appointed editor of the Westminster review in 1825 and, through his writing for the Review, was already making a name as political economist and reformer. In this instance, however, John Bowring appears to be submitting copy to a rival publication, the Morning Herald, of which Henry Thwaites was one of the proprietors. In 1828 the circulation of the Morning Herald was second only to the Times. Following the French invasion of Spain, many persons had become displaced and a number of Spanish nationals had arrived in Britain as refugees. Public sympathy was aroused by the hardships they had suffered and funds had been set up to assist them. The Times of December 1828 reports on one such fund, of which "Mr Freshfield" was the recipient of subscriptions. This was probably James William Freshfield (founder of the firm of London solicitors) who was a member of the Clapham Sect of reformers. The plight of the refugees was one of the earliest examples of a kind of social journalism of which John Bowring was one of the earliest exponents - a style which was later taken up by John Bright and other social reformers.